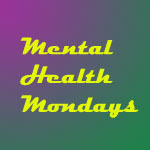 LuAnn at Back Porchervations is starting a new meme called Mental Health Mondays. Her purpose for this weekly meme is "to reduce some of the stigma associated with mental illness by talking about it more...in public." And, having suffered from various mental health issues for most of my life, I highly applaud her efforts. Talking about my own depression isn't something new here on Sanity's Overrated. But for this first week of LuAnn's meme, I'm going to talk about an aspect of my own mental health that I don't talk about often - social anxiety. I don't remember when, or even if, I was formally diagnosed with social anxiety disorder. All I know is that when I was doing an intake to see another new therapist and was told that my fear of making phone calls, of dealing with the public, sounded like social anxiety disorder to the person doing my intake, I felt relief. What I'd thought of as an abnormal quirk that fed into my depression actually had a NAME. And if it had a name, it meant I wasn't alone. And that was the biggest relief I'd felt in so long. I also don't remember when these fears started. In high school, I had no problem making phone calls. It drove my step-mother nuts because, like a lot of teens, I spent too much time on the phone. Granted, it was friends rather than calling places like the local pizza delivery, but even those calls weren't a problem. And I worked at McDonald's through high school, having hectic days of people coming in for food. Dealing with people was something I could do with my eyes closed. But by the time I met my husband, I couldn't make the calls that I needed to for appointments. I couldn't go into businesses for anything more simple than to make a routine purchase. Anything that might put me in even the slightest bit of conflict with someone scared me senseless. Part of what lead to it, I think, was a bad relationship I was in. For seven years, my self esteem got lower and lower, and it was more and more difficult to think I could do anything right. It started to slide into my professional life, where I was working as a customer service rep. I'd get calls from frustrated members and they would take their frustrations out on me, "proving" that I was everything I'd thought of myself. From there, making calls for anything else just got more and more difficult. What if I said or did something wrong? Would the people I was dealing with treat me with contempt? Would they laugh at me? It was easier to not deal with it at all and just pretend I was an ostrich with my head in the sand. Even calling friends and loved ones became difficult. What if they were busy? What if they didn't really want to talk to me? I couldn't put myself out there for them either. As the internet grew and e-mail became more popular, I was able to avoid putting myself in uncomfortable situations. Instead of making phone calls, I e-mailed people. Instead of going in to stores to buy something, I purchased it online. I tried to have as many interactions online as I possibly could. Dealing with people was too scary. I've been trying to force myself to change this, however. I can't let myself hide from the world. There are too many times that I can't have Rich make calls for me - particularly when it comes to trying to get help for me with regard to my mental health. There are times when, because I'm the one at home, it makes more sense for me to be the one to call when something needs to be done for the kids. And I'm forcing myself, a little more each month, to make those calls. Even today, I made a call that I needed to, a call to try to get help for Pete with his issues at school. Am I ever going to be able to pick up the phone and make a call as easily as someone that doesn't have social anxiety disorder? Probably not. Like my depression, this is something that I'll probably be dealing with for much of my life. But it's something that I can try to make better. Tomorrow I have my second appointment with my therapist. Last time, we talked about the stresses that I've been dealing with regarding getting and keeping the house clean. Now, though, since I'm getting myself more under control in regard to that, I'm going to talk about the social anxiety issues. Because it's something that I desperately need to work on in order to make the most of who I am. And maybe she'll have some great ideas to help me get past my issues. I won't know until I talk to her.